A really firm crunch that sustained throughout the Crisp eating process. Each individual Crisp felt like a meal. Oddly, a few smaller Crisps in one mouthful seemed to have less crunch as they melted a little in the mouth. The Crisps came in different shapes and sizes and few had smooth edges as most were covered with a reddish brown seasoning powder. The surface of the Crisps were orange and bubbly from the hot oil, but although Kettle Cooked they did not feel overly greasy. 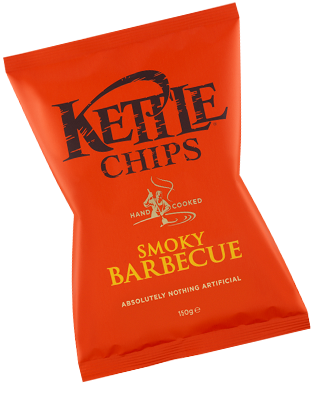 The residue left on fingers after a bag plunge was not nearly as bad as most of this type of Crisp. 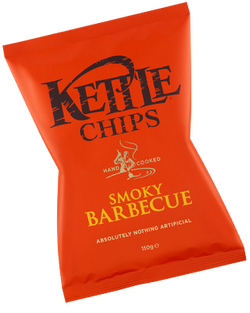 The aroma when opening the bag was literally what it says on the front - Smoky Barbecue. A light smell that welcomed fingers! There was no heat at all, but the sticky sweet flavour left a pleasant after-taste.